As a Christian, you have a Biblical help to fight your cravings! You can stop overeating with these tips taken straight from the Word of God! How do you fight overeating? If you battle like I used to, you pull out the latest diet in an attempt to rein in your flesh. Maybe you swear off entire food groups or maybe you weigh and measure every bite you consume. And, of course, I would craft my own dietary rules and regulations. Because, surely, if I could just make myself stop the behavior, everything would change. All of the nutritional knowledge in the world cannot change us on a spiritual level. I think it is very possible, even very likely, that God has allowed us to fight this battle with food for a greater purpose. This trial you are facing, this thorn in your flesh, is about so much more than simply walking away from a plate of brownies. Ephesians 6:12 NLT For we are not fighting against flesh-and-blood enemies, but against evil rulers and authorities of the unseen world, against mighty powers in this dark world, and against evil spirits in the heavenly places. You are probably familiar with the story of David and Goliath. David, a humble shepherd, was faced with a battle against the giant Goliath. While he was offered the most extraordinary armor from the king’s court, he chose to fight this massive threat with simply a sling and a stone. David prevailed because David went into battle with the precise equipment that God had called him to bear. You and I are also privileged to know how God has called us to fight! Ephesians 6:10-11 NLT A final word: Be strong in the Lord and in his mighty power. Put on all of God’s armor so that you will be able to stand firm against all strategies of the devil. I will be completely honest here and say that the armor of God always felt mystical to me. After all, I am not picking up a physical shield or sword and I certainly don’t want to sport a helmet for a Target run. But then again, maybe I would have… this battle with food is HARD and freedom, it would be worth the helmet hair. While these tools are not physical, they are not mystical either. 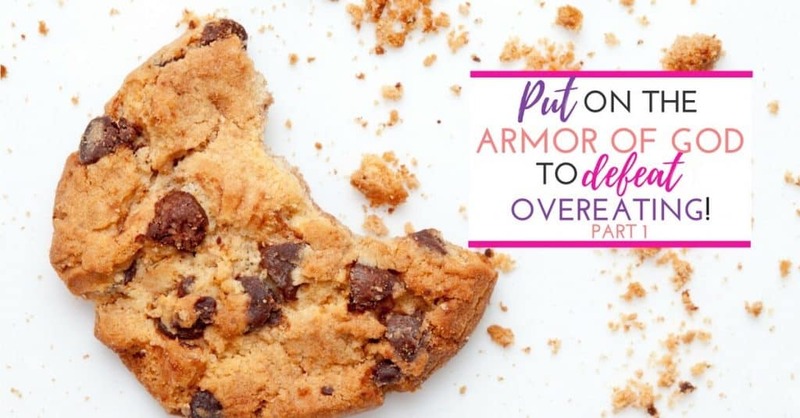 There are concrete ways we can truly “put on the armor of God” for this battle against unhealthy behaviors. Below I will walk you through each of the pieces of armor, offering practical solutions that you can apply today. My suggestion would be to read over the list and then prayerfully choose ONE area to focus on. A warrior learns how to battle one step at a time. That’s you, my friend! (even if you feel as though nothing works for you)? Ephesians 6: 13-18 NLT Therefore, put on every piece of God’s armor so you will be able to resist the enemy in the time of evil. Then after the battle you will still be standing firm. Stand your ground, putting on the belt of truth and the body armor of God’s righteousness. For shoes, put on the peace that comes from the Good News so that you will be fully prepared. In addition to all of these, hold up the shield of faith to stop the fiery arrows of the devil. Put on salvation as your helmet, and take the sword of the Spirit, which is the word of God. Pray in the Spirit at all times and on every occasion. Stay alert and be persistent in your prayers for all believers everywhere. The Belt of Truth holds us together. Or, as John 8:32 states, the truth sets us FREE! One area many of us foster lies is found in how we eat. After all, who hasn’t said that they “cheat” on their diets? I have invented every type of excuse to eat when I am not hungry and each of the excuses was built upon lies. Do any of these sound familiar? When we step back and examine these ideas, it is pretty easy to see that, when we believe them, we are standing on shaky ground. If you are creating reasons to eat, it’s no wonder that you are struggling to stop. While believers are blessed with the indwelling of the Holy Spirit, when we believe these lies, we are listening to the Father of Lies (John 8:44). The Belt of Truth will complement any outfit. Rather than fall prey to these lies hook, line, and sinker- put on your Belt of Truth! Ask yourself, “What does the Bible say about these excuses?” Run these excuses past the Holy Spirit, your inner wisdom. Can you call yourself out on some lousy justifications? While it can be uncomfortable to notice and name our reasonings, it is much more uncomfortable to live a life lacking integrity. Know the truth and DO the truth. Peace, joy, and weight loss will follow you! Body armor, or as it is often called, the breastplate, is meant to protect the warrior’s heart and vital organs. In Proverbs, we are instructed to guard the heart above all else– for it determines the course of our lives. Here in Ephesians, we are told how to protect our hearts- with righteousness. Righteousness, in short, is right standing with God. Our righteousness is found because of and in our relationship with Christ. We are the apple of God’s eye (Psalm 17:8). Proverbs 4:23 NLT Guard your heart above all else, for it determines the course of your life. I don’t know about you but I often feel like a bad apple. Like, no matter how hard I try, I fall short. While it is true that without Christ we are “rotten to the core,” IN Christ we are shiny and new. But Satan is the accuser of the believer (Revelation 12:10) and he wants us to feel anything but righteous because he knows that wallowing in our failures will put a wedge between us and God. So, how does this relate to overeating? How often do you find yourself turning to food when you feel like you have “failed”? In those times when you get overwhelmed and feel like you will never measure up… Food can become a source of solace and comfort when our self-talk turns sour. Overeating may feel like our only “escape” when we are bogged down with our works. When we get wrapped up in all of our inadequacies, we have actually jumped the ship of grace into a sea of legalism. And, when we start to get legalistic about our performance, it places a wedge between us and God. You see, we can’t help but cast our disappointment in ourselves onto our Savior. But, praise God, that is not how He feels and this is not how He intended us to live our lives! Notice the negativity and take it to God. Dive into the Bible, the book with the final say-so, and see what it says about you. Cut yourself some slack and embrace the fact that you are human. You are 100%, beyond a shadow of a doubt, going to trip and fall on a daily basis. And guess what, our Heavenly Father will pick you up and dust you off each and every time. He’s a good, good Dad. 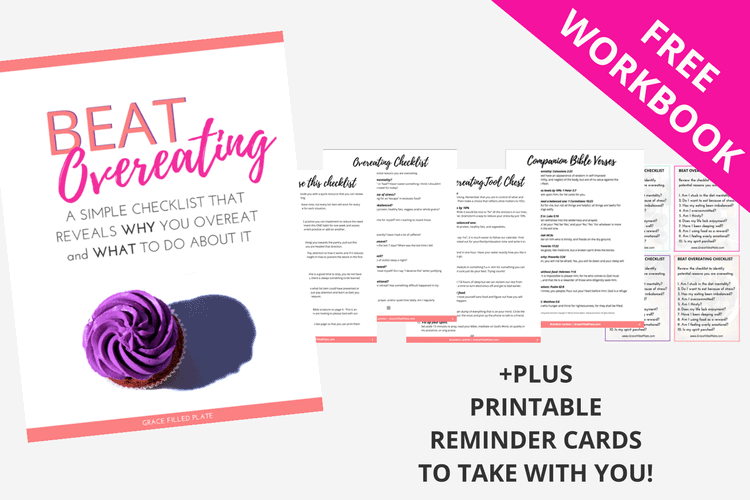 One of my favorite sayings is that “a binge never happens in a peaceful environment.” Overeating, bingeing, and mindless eating– these behaviors piggyback on stress, anxiety, depression, and a host of other unpeaceful emotions. Now, because we reside here on earth, we will encounter all of these states throughout our lives, but we do not have to let them set up camp in our hearts and minds. There is a Solution- LIGHT! If we walk into a dark room, how do we “fight” it? Do we wrestle the darkness until it becomes light, using our ninja skills to force it into submission? No! We simply… turn on the light. Darkness can NOT exist in the presence of light. 1 John 1:5 NLT This is the message we heard from Jesus and now declare to you: God is light, and there is no darkness in him at all. In the same way, rather than fighting the desire to eat, we may bring Peace into our situation. God IS light and peace (Philippians 4:7). When we ask for Him to fill the space of our struggle, He will show up. Through praise, prayer, reciting the Word, or quietness, He will meet you where you are. But, we do need to be proactive and put on our shoes of peace. Our battle to stop overeating can be fought with much more effective tools than the latest diet. As a Christian, God is likely using this battle to draw you closer to Him and to create in you a deep need to rely fully on Him. While this battle with food may feel like a curse, with Paul, we may say that we boast in our weaknesses for these “handicaps” allow the power of Christ to rest upon us (2 Corinthians 12:9). BE SURE TO CHECK OUT PART 2 HERE! This is exactly what I’m struggling with myself and your post was SO encouraging and helpful! I cannot wait to read the second one! Thank you for sharing your wisdom!!! Yes! I can only say that this showed up on my Pinterest timeline just in time, the very same thing I was praying to God about needing help with just yesterday. Thank you thank you God is good. Amazing post, thank you very much for being so real and so spiritual on this topic! I have recently had a couple of health scares, and I know that God had to allow those in order for me to get serious about my health. Ever since then, so man of the verses you quoted on the blog are ones that have been going over and over in my heart. Thank you so much for allowing the Spirit to lead you to talk about these inner-battles that we as christian women have more often than not! Sofia, I am sorry to hear about your health struggles but am encouraged to hear how God is using them for your good. While making changes isn’t easy, when we have big things at stake, it gets easier. 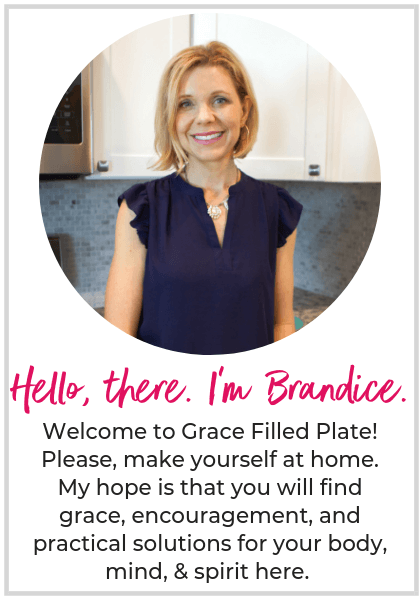 I hope you can find some encouragement for your journey here! Awesome Tia! Emotional eating is a difficult challenge to overcome on our own. I hope these tips gave you some ideas to apply to your daily walk. Please keep in touch! I love this article! Can’t wait for part 2!!! I’ve really been struggling since having 2 major surgeries on my knee within a year. The lack of being able to move well led to depression and overeating. After losing 100 pounds 2 years ago I found myself gaining back some of the weight. I don’t want to go back there!!! Yay Eva! I’d love to hear how you apply the principals! Hi! I am just thankful and amazed with God in that He knows what we need before we do and before we even know we need it. I got on Pinterest and there it was, an actual battle plan to defeat over- eating. I have been battling with the stronghold of over-eating for about two years. It was only a few months ago when I realized I had an “addict” mentality and often obsessed about eating. But, God is so gracious and patient, very often telling I need to break this habit. Yet, I have been the Israelites described in Jeremiah 2:23-25. However, I know there is hope for us and anyone that struggles with the bondages is sin – no matter how “silly” it may seem. God’s grace is sufficient, which I have learned in this seemingly never ending trial. There is hope, no mate what do not give up and keep coming to God until the false arguments (lies) of this stronghold are completely demolished. I thank God for this post and for you making yourself available to God by sharing this Good News. Hi Rayana! I am blown away by how God meets us where we are. Even on Pinterest! You are SO right- God is in the midst of every trial and He will use it to make us more like Him. Not giving up, is is a fruit of the Spirit that you are walking in 🙂 Please reach out if I can help! It helps to recognize all the areas that we are walking in the Spirit. We CAN do it (through Him!)! So happy to hear this Susan! This resonated like a thunder in my heart. Food is the one compartment of my life that I have tried to keep hidden. How could I act as if everything else was open to God’s love and mercy, except food. Thank you for this post. I never thought about running my excuses through the Holy Spirit! That was an eye-opener! Food is a tough one because it is something we need. Just a tip- when God prompts us to change it is convicting but there will be an excitement and power to turn around. If you are examining those excuses and you feel condemned, be sure to refocus on God’s grace. Let me know how it goes! I appreciate your site and the information you present. It is helping me get back to eating when hungry and stopping at satisfied. I am just finding your treasure trove of Biblical, Spirit filled dieting advice on Pinterest. For me it’s another tool in my belt to becoming complete – mind, body and spirit and truly surrender Everything to God! Thank you!